Most long range shooters are aware of the effects of gravity, air resistance (drag) and wind on their bullets trajectory. 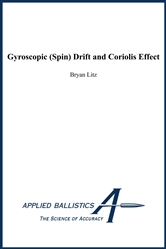 There are many commercial ballistics programs on the market that do a fine job of predicting trajectories which only account for gravity, drag and wind. Gravity drag and wind are the major forces acting on a bullet in flight, but they’re not the only forces. In this article, I’ll explain some of the more subtle forces that influence the path that bullets take.